There’s never been ONE like this. Introducing the SINGER ONE™ sewing machine. Its bold, fresh design stands out for a reason. 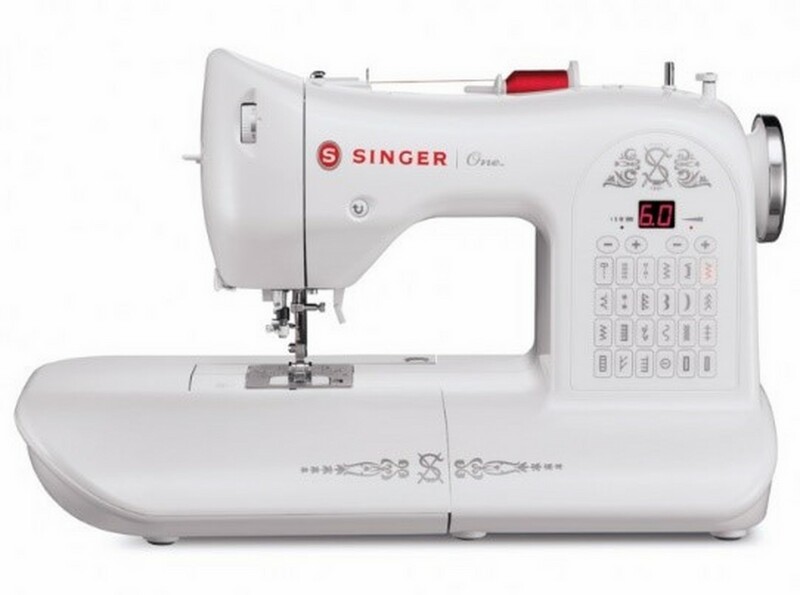 The SINGER ONE™ sewing machine is the start of a new line, built for the way you sew, with just the right combination of easy-to-use features, technology and style. We changed home sewing forever with our first machine. 160 years later, we’re still bringing you the next big thing. Easy to Select, Easy to Personalize. This direct stitch selection sets optimal stitch size for better results. Includes most popular stitch patterns: 6 Basic, 4 Stretch, 12 Decorative and 2 Buttonhole. Buttonhole sewing is a one-step simple process, providing reliable results every time. Each side of the buttonhole is sewn in the same direction creating beautifully balanced buttonholes. Sewers guide the thread directly from the spool to the needle area through a single groove and thread the needle by simply pressing the lever for true, simple one-touch threading! Optimal stitch setting shown as stitch is selected. When either the length or width of a stitch is changed, the LED light turns yellow to notify the sewer of the change. With this special top drop-on bobbin, there’s no longer any need to raise the bobbin thread before sewing. Just drop and sew! Ensures the presser foot is in position for an easy start. The machine will not start but rather alerts you with a “beep” sound if presser foot is not in the down position. Not just one but three lamps illuminate the sewing surface for optimal viewing. The long-lasting bulbs (100,000 hours) stay cool regardless of how long the machine is being operated. A conveniently located lever, easily and effortlessly moved, will lower the feed dogs for free-motion embroidery, monograms and for sewing buttons. Provides a more spacious working area, an essential for quilting, home décor sewing or when working with other larger projects. Nostalgic filigree and signature machine curves pay tribute to our classic historic machine designs. Offers more clearance, which is needed when placing multiple layers of bulky fabric under the presser foot. The internal rigid support holds all the mechanisms in perfect alignment for skip-free sewing and overall durability. Projects can be sewn quickly with a maximum speed of 750 stitches-per-minute. Provides easy access to cuffs, collars, trouser hems and other difficult to reach areas. All-Purpose Foot, Blind Hem Foot, Satin Stitch Foot, One-step Buttonhole Foot, Zipper Foot, Needles, Bobbins, Spool Pin Felt, Auxiliary Spool Pin, Thread Spool Caps, Needle Plate Screwdriver, Lint Brush/ Seam Ripper and Soft-Sided Cover. The accessories are conveniently stored in the removable storage compartment providing easy access.